Pulsair offers magnesium hydroxide mixers. Pulsair’s Systems proven mixing process is the industries best mixing solution to keep magnesium hydroxide slurries homogeneous and uniformly suspended in storage tanks. 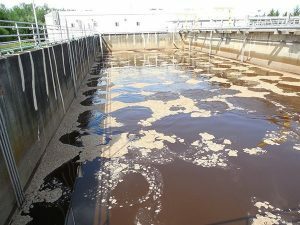 Improper mixing (usually top-entry mixers or recirculating pumps) will only push the slurry sideways or down based on the directional flow of the impeller blades. The Pulsair magnesium hydroxide mixers start at the tank bottom and works by scouring the tank floor and they lifting the magnesium hydroxide slurry to the liquid surface with sequentially injected bursts of compressed air. Pulsair mixing tank systems can mix any liquid level in the tank and there is no extra motor mounted supports needed or any fear of clogging up recirculating pumps. Pulsair has the best slurry agitation process for keeping magnesium hydroxide slurries suspended and uniformly mixed in magnesium hydroxide storage tanks. The Pulsair mixing tank process also works to re-suspend settled magnesium hydroxide slurries in rail tank cars (see video clip below). Granite rock particles in slurry / sludge holding tank being agitated and mixed with Pulsair.